Fleets will be able to benefit from special charging tariffs for a network of solar-powered, fully off-grid electric vehicle charging centres due to go live in the UK from late next year. 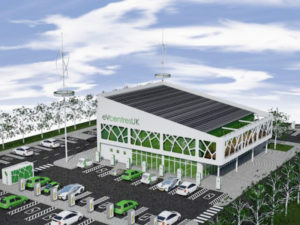 Housing up to 20 rapid charge points, using 100% renewable energy generation through solar and wind power, the eVcentres charging sites will be aimed at fleets as well as private users. Now the firm has said that it will be offering a special pricing model for commercial car and van fleets as well as taxis, and will be looking to cater for lorries and buses. No specific details are available yet, but CEO Richard Gordon said the firm is looking to work with and encourage commercial fleets at its sites. The firm has already secured the first for sites for the network, which are located among of the UK’s major trunk routes, with three in England and one in Scotland. The sites are currently awaiting planning permission and expected to start development in the summer.